Eka Beselia, Chairperson of the Parliament’s Legal Affairs Committee, does not rule out the Georgian Dream ruling party to select its presidential candidate in an unusual manner and name the candidate, who is not a member of the party. Beselia claims that the ruling team does is not waiting for the president Giorgi Margvelashvili's position over the topic and has its own agenda. “I think the party chairman Bidzina Ivanishvili will deliver interesting and open messages soon. The team has its position and I think the candidate will be named soon. “As for the criteria, he/she should have political experience, awareness in terms of public relations, trust and so on. We are mulling over whether the candidate should be the face of the party, or not,” Beselia said. The ruling team may use age and gender as the criteria for choosing presidential candidate, the chairman Irakli Kobakhidze told reporters on Tuesday. "According to the Constitution, the President should be neutral, above-party politician and loyal attitude to the party should not be criteria. He/she should be a loyal to the system, state and the principle that our state is based on. During the last 5 years, we saw the President, who was a loyal to the certain political parties. “We do not want to repeat such a president. Loyalty to the party and the Georgian Dream will not be a criteria. We may use age and gender as criteria, because we see that our presidential campaign is very masculine, and only male candidates are nominated,” Kobakhidze said. Margvelashvili has not yet revealed his plans for presidency. 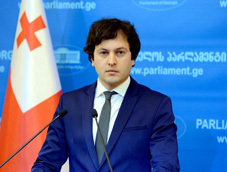 He stated that the Georgian Dream is waiting for him and they may nominate their candidate only after he announces his decision. The European Georgia opposition party has named ex-Parliament Speaker David Bakradze for presidency. The United National Movement, together with nine other opposition parties, nominated former Foreign Minister Grigol Vashadze.